The art of jewellery was born in Tuscany since the Reinaissance and the goldsmiths pass their crafts and traditions from parents to children. 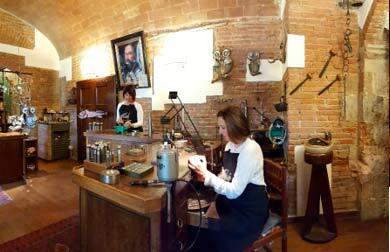 Don’t lose the opportunity to visit an authentic workshop, located in an amazing old tower. You enter a welcoming working room in the goldsmith’s house, and find yourself surrounded by all sorts of working tools, from pincers to precision instruments. During the visit, you can have a look on the different processes to create a jewel, from the melting until the stonesetting. A fascinating trip in a «golden» world, where you can admire the goldsmiths during their work and the birth of a jewel.